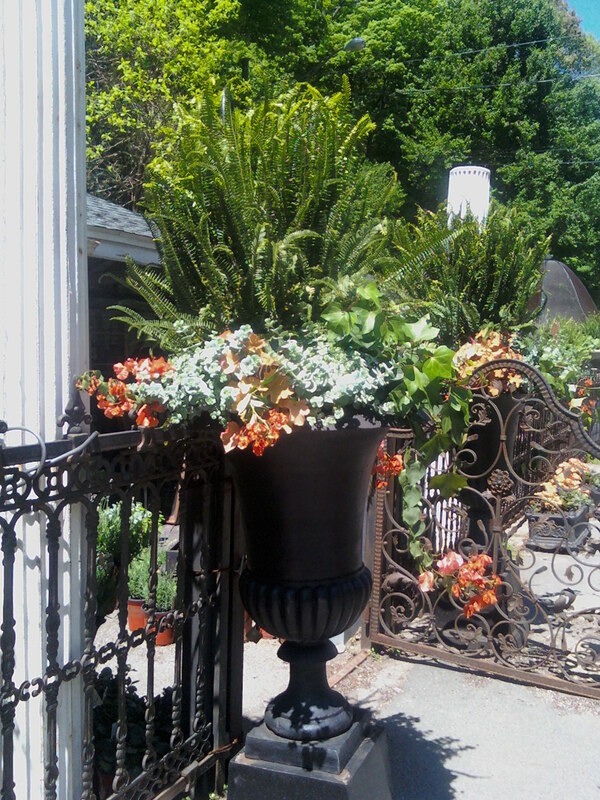 Marvin Gardens takes pride in creating low maintenance container gardens at the home owner’s site. Amabel will come to your home and transform individual containers into lush, long lasting plantings that will carry a beautiful effect from late April to late November – no fertilizer or dead heading required! Each container is filled to the brim with composted soil that will feed the plants for the duration of the season. Plants are chosen according to the home owner’s selected color pallet and personal style. Amabel impresses upon the homeowner that common flowering annuals typically require frequent fertilizing, watering and dead heading to maintain a lush effect. In lieu of using such high maintenance plants, a variety of perennials, leafy tropicals and a limited number of annuals (typically only white double petal impatiens) are used. Book your appointment now. On site container gardening begins late April, but keepin mind that the frost date is typically Mother’s Day. Some frost protection may be required if April planting is requested. Cost of container gardening is $30 per container and the retail cost of plants. A delivery charge may apply depending on proximity to Wilton. There is no charge for the compost soil and your container garden will not require any further enhancements until the first hard frost in the fall!